Another repair method makes a small incision on the back of the lower leg at the site of the rupture. A series of needles with sutures attached is passed through the skin and Achilles tendon and then brought out through the small incision. The sutures are then tied together. 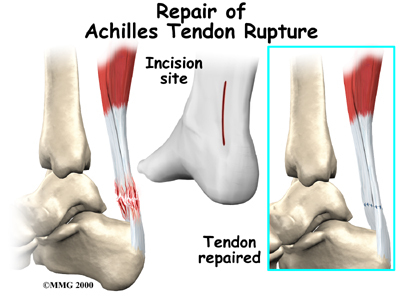 The best surgical technique for your Achilles rupture will be determined by your foot and ankle orthopaedic surgeo.